For the 24 hours to 23:00 GMT, the EUR declined 0.07% against the USD and closed at 1.1625. Macroeconomic data showed that Germany’s seasonally adjusted factory orders unexpectedly eased 0.9% on a monthly basis in July, weighed down by US President Donald Trump’s protectionist policies and defying market expectations for a gain of 1.8%. In the previous month, factory orders had declined by a revised 3.9%. In the US, data revealed that the US final Markit services PMI dipped to a level of 54.8 in August, overshooting market consensus for a fall to a level of 55.2. The preliminary figures had recorded a drop to 55.2. In the previous month, the PMI had registered a level of 56.0. Moreover, the nation’s factory orders retreated 0.8% on a monthly basis in July, more than market expectations for a decline of 0.6%. Factory orders had advanced by a revised 0.6% in the prior month. Also, final durable goods orders dropped 1.7% on a monthly basis in July, in line with market expectations and confirming the preliminary print. In the previous month, durable goods orders had registered a revised rise of 0.7%. On the contrary, the non-manufacturing PMI climbed to 58.5 in August, compared to market expectations for an advance to 56.8. The non-manufacturing PMI had registered a reading of 55.7 in the prior month. Further, the region’s seasonally adjusted initial jobless claims surprisingly fell to a level of 203.0K in the week ended 01 September, registering its lowest level since December 1969 and compared to a reading of 213.0K in the previous week. Market participants had envisaged the initial jobless claims to record a steady reading. Moreover, the US ADP private sector employment climbed 163.0 K in August, less than market anticipation for an advance of 200.0K and after registering an increase of 219.0K in the previous month. In the Asian session, at GMT0300, the pair is trading at 1.1619, with the EUR trading 0.05% lower against the USD from yesterday’s close. 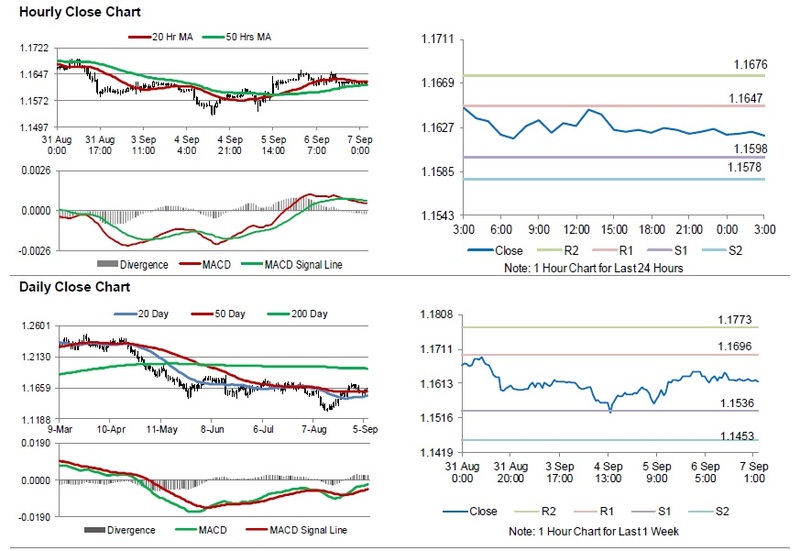 The pair is expected to find support at 1.1598, and a fall through could take it to the next support level of 1.1578. The pair is expected to find its first resistance at 1.1647, and a rise through could take it to the next resistance level of 1.1676. Moving ahead, investors will keep an eye on the Eurozone’s 2Q GDP figures, due to be released in a few hours along with Germany’s trade balance data and industrial production, both for July, set to release in a while. Later in the day, the US non-farm payrolls, unemployment rate and average hourly earnings, all for August, will keep traders on their toes. The currency pair is showing convergence with its 20 Hr and 50 Hr moving averages.